This light-hearted thriller is about a rag-tag, unconventional group of security experts, who are pressed into service by supposedly C.I.A. agents to steal a top secret computer chip that can decode any computer, putting themselves in a dangerous, deadly game of intrique. 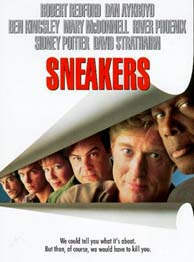 The cast includes: Robert Redford, Sidney Poitier, Ben Kingsley, David Strathairn, Dan Aykroyd, River Phoenix, Mary McDonnell, Donal Logue, and James Earl Jones.